Spoonful’s Chef’s Table Series is back and it will be a Christmas Special! Partnering with Lewin Terrace restaurant this time, we will be offering a cooking session by Chef Takegoshi and a 3-course lunch, at a special price! Note: This session is conducted mainly in the Japanese Language however, an interpreter/translator will be on site for assistance. 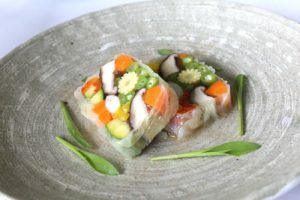 Chef Takegoshi of Lewin Terrace has developed his career over at numerous fine dining restaurants including the Imperial Hotel, the French Embassy’s residential chef and joined Best planning – LEWIN TERRACE’s parent company, as a head chef in his 30s youth. Currently, he manages the culinary team of Lewin Terrace in Singapore and Japan and Best Planning group’s culinary creation. He is working across both countries between Singapore and Japan and never forgets his challenging spirit to creating new tastes and menu developments. For this class, he wants to introduce French cuisine that we can replicate easily at home! Chef Takegoshi is also really passionate about the environment and takes extra measure to curb Food Waste! Hence for this X’mas menu, the same ingredients for the starter and main will be used in a bid to maximise usage of all whole ingredients (especially in the case of home cooking where we do not have the luxury of storing a large variety of ingredients!). In this class, you will learn how to make totally different food using the same ingredients! In the making of Vegetable Terrine, the leftovers will be used to make Ratatouille, to go with the chicken. The chicken meat will then be sauteed and the bone will be used as part to make the terrine. For the dessert, the chef will introduce the mini cheesecake that is easy to bake at home. Thinking of the nutrition, we will be using brown sugar for the base of the cake. This is a great class to learn before Christmas and then you can host an intimate Christmas dinner with your family and friends. Please try to replicate this as this year’s Christmas meal! 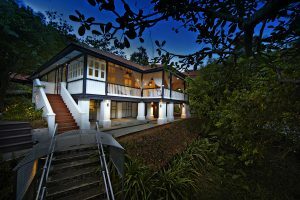 Situated as a Black & White house restaurant in the area surrounded by greens at the foot of Fort Canning Hill, enjoy cooking classes and lunch in an elegant colonial-style atmosphere. 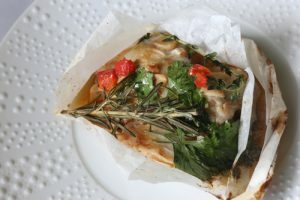 “I often think about what kind of menu you would be delighted with and about the composition of the menu that one can easily reproduce even at home. Of course, cooking tips will be advised from a professional perspective during the class. Also, in Singapore, where you can buy a whole chicken with an affordable budget, it is useful to remember tips on how to select chickens and apply them for your home cooking as well. I will also demonstrate how to select your ingredients. Graduated from Musashino Cooking College. 2001 Studied at hotel restaurant starting Hotel New Otani. In 2010 he joined “Best Planning” and was appointed as chef of the present Aoyama St. Grace Cathedral from the “Best Planning” Group. He managed the cook for many celebrities’ wedding dinners. Currently, in Japan, he supervises the menu of the entire group company, and in Singapore, he serves as the chef for LEWIN TERRACE.